200 years! Time flies. Seems like only yesterday we celebrated the Big 100 with the 1918 construction of Springfield’s Centennial Building and obelisk monument (“chicken-on-a-stick”) in Chicago’s Logan Square. Our 1968 Sesquicentennial produced a history of all 102 counties by prominent writers and limited-edition Winchester .30-30 rifle. The "chicken-on-a-stick" obelisk in Logan Square was built for the 1918 Illinois Centennial. Courtesy Busy Beaver Museum. The State Bicentennial Commission held “Constitution Day” (Aug. 26) events: Dedication of Springfield’s Bicentennial Plaza (hottest day in 200 years, seemed like) and a Mother Road Motorcycle Ride (which snarled traffic - including this author - for miles). The "Bicentennial Passport" which would boost tourism at 56 stops was a good concept...wonder if anyone did it. The rehab of the Executive Mansion is great. On “Statehood Day” (Dec. 3), there was a gala event at Navy Pier (switched from UC due to sluggish ticket sales...the Ballroom is a better space anyhow). Wayne Mesmer appropriately belted out the Anthem and Bill Kurtis belted out the program. I was hoping to see Joe Mantegna (Fat Tony! Medusa Challenger! ), but it was only his voice. Words from Rauner, Pritzker, Superfans and my fave - Jackie Joyner Kersee. The Eli's Cheesecake was damn good. Still, I felt let down, like a big milestone came-and-went too quickly, and a chance to unify was wasted. 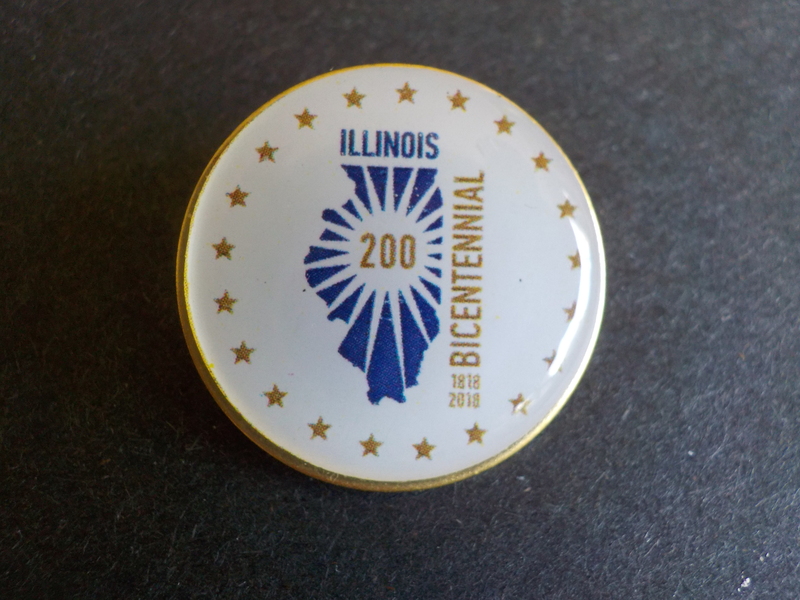 Never too late to catch Bicentennial Fever! 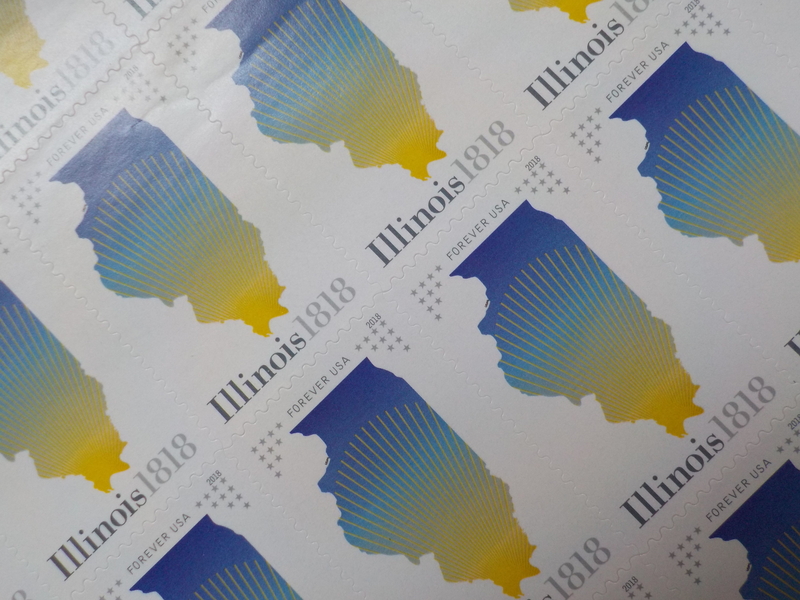 The Chicago Tribune’s “Bicentennial Bucket List” series and Chicago Sun-Times’s “Illinois 200” magazine are terrific. 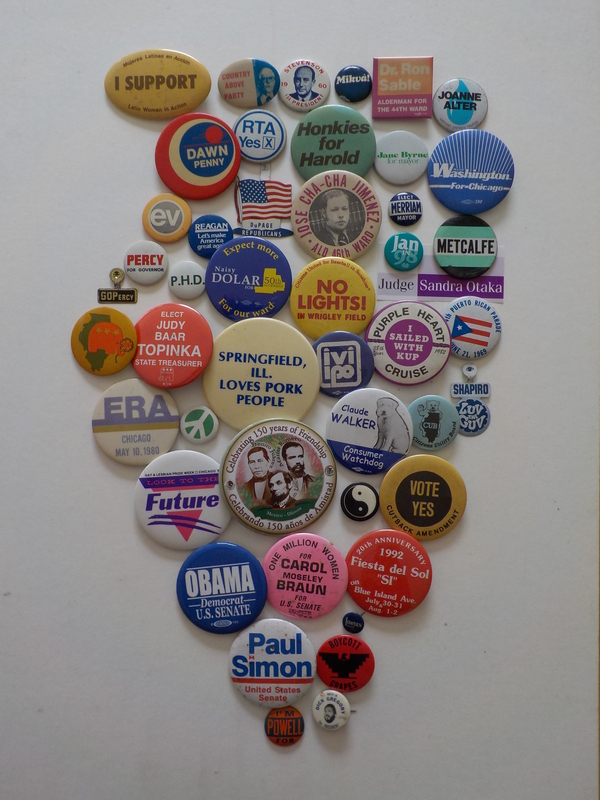 This online exhibit is one modest way to engage everyday Illinoisans, school-kids and political junkies alike. A birthday milestone is a time for reflection. Lots of hard work, dreams, shattered hopes. 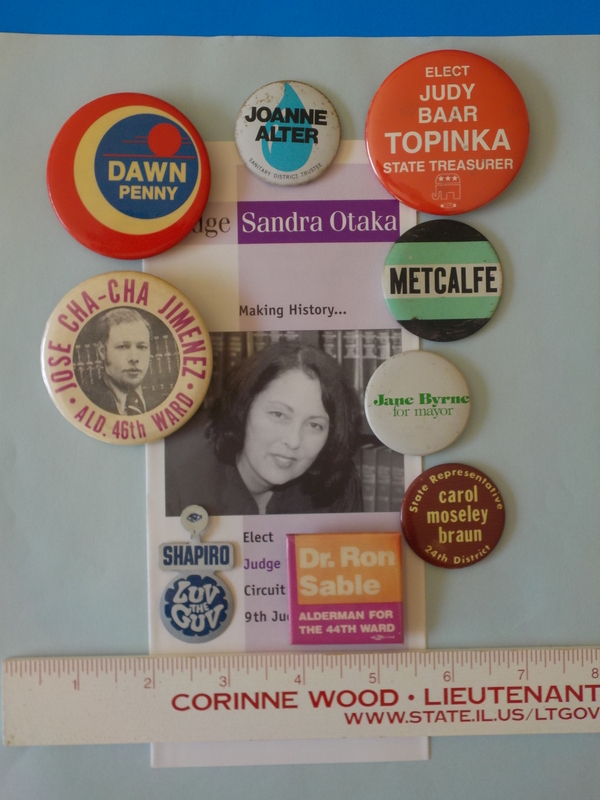 Lots of political buttons, each with a story to tell. I’ve been a collector since 1960 when my legislator grandfather gave me my first (“Nixon - Lodge”). I bought my first button in ‘64 (“AuH20”) and was hooked. 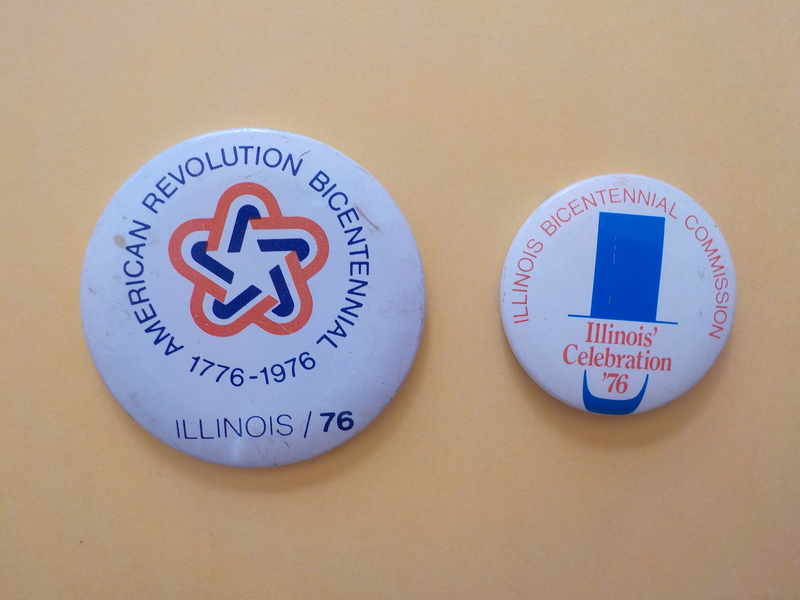 Having since been active in some 80 Illinois political campaigns and causes, I’ve snatched buttons whenever possible, building a 4,000-item collection. 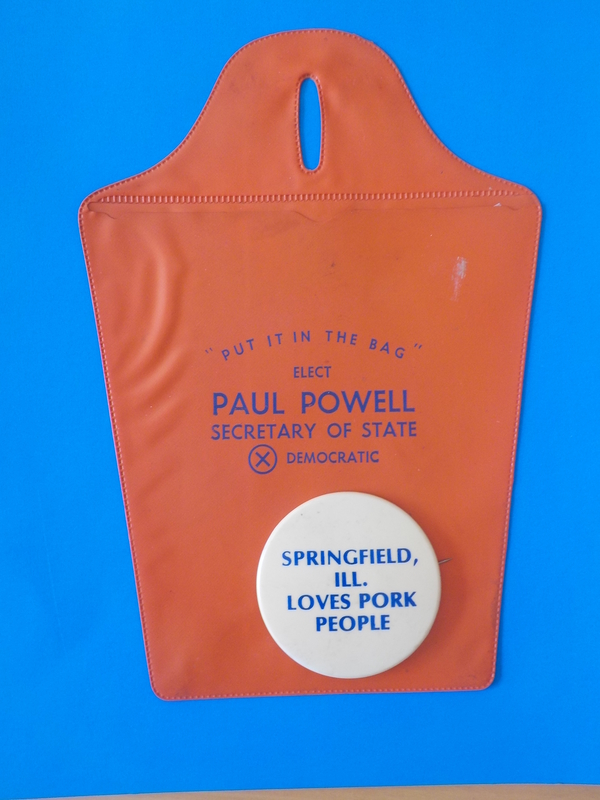 I’ve designed 25 buttons and lament their disappearance from most campaigns. 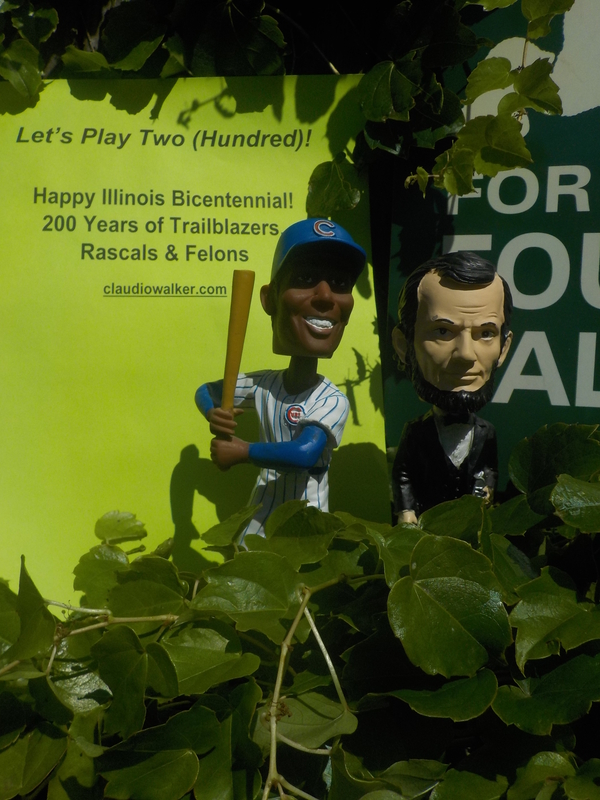 Each “gallery” serves up a slice of Illinois history, i.e. “Women Trailblazers” or “Adlai & the LaRouchies”. The “BUSTED! Galleries” feature pols who got BUSTED! The “Land of Linkin’ Galleries” show how Illinoisans are linked through sports, events and Route 66. Let’s play 200…more! 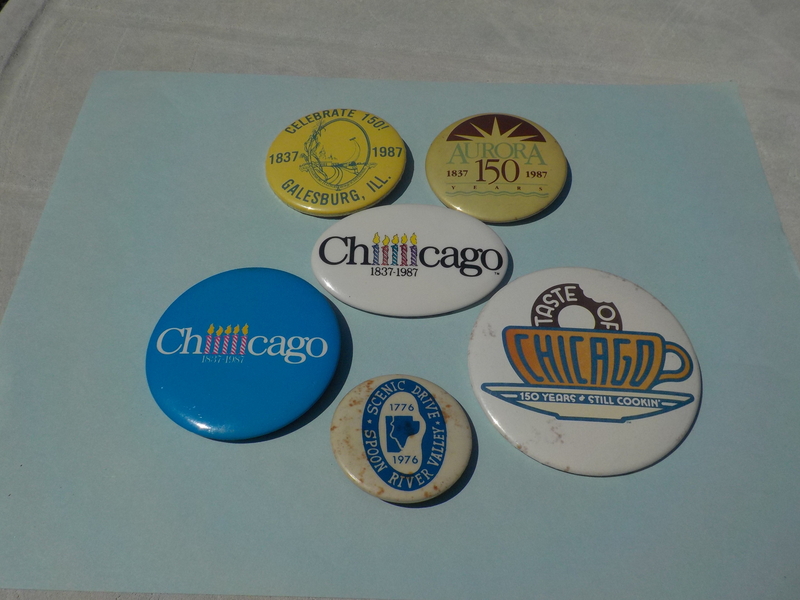 Aurora, Galesburg and Chicago Sesquicentennial 1987. Shabbona Centennial courtesy Busy Beaver Museum. Not everyone was celebrating in 1976. 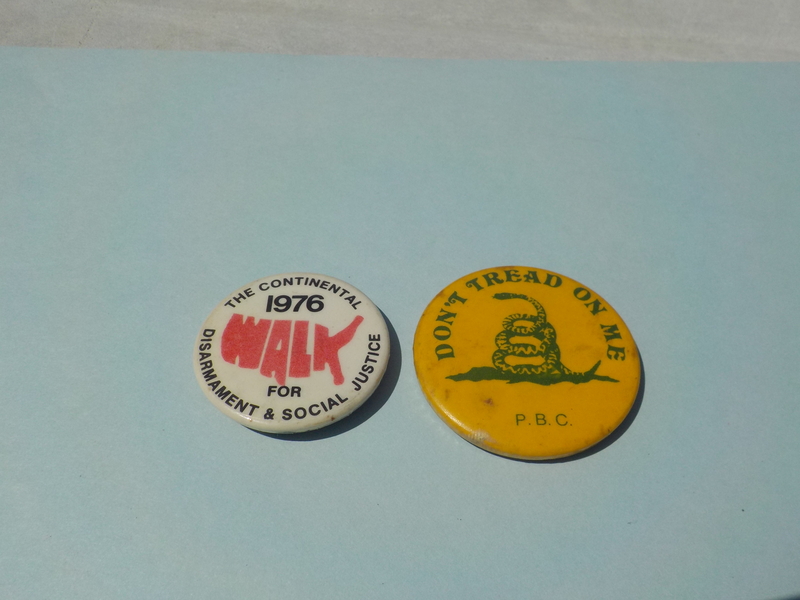 There was the “People’s Bicentennial Commission” and a protest walk across the USA. 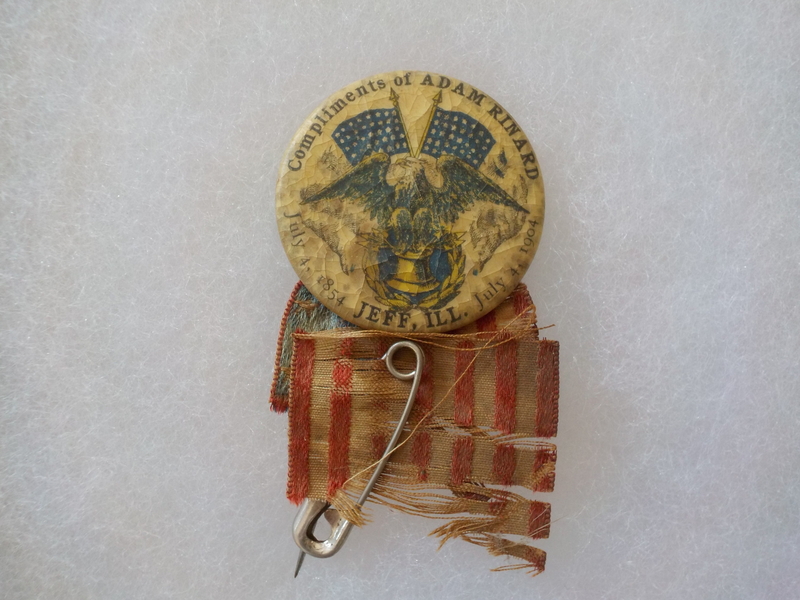 “Jeff, Illinois 1854-1904 Compliments of Adam Rinard” The oldest button in Claudio’s Museum. Jeff (in southeastern Illinois) was known as Jeffersonville and now goes by “Geff”. While Ohioans had settled nearby in the 1830s and set up a fur trade and distillery, Rinard’s dad - J.S. Rinard - built the first buildings in town in 1854. 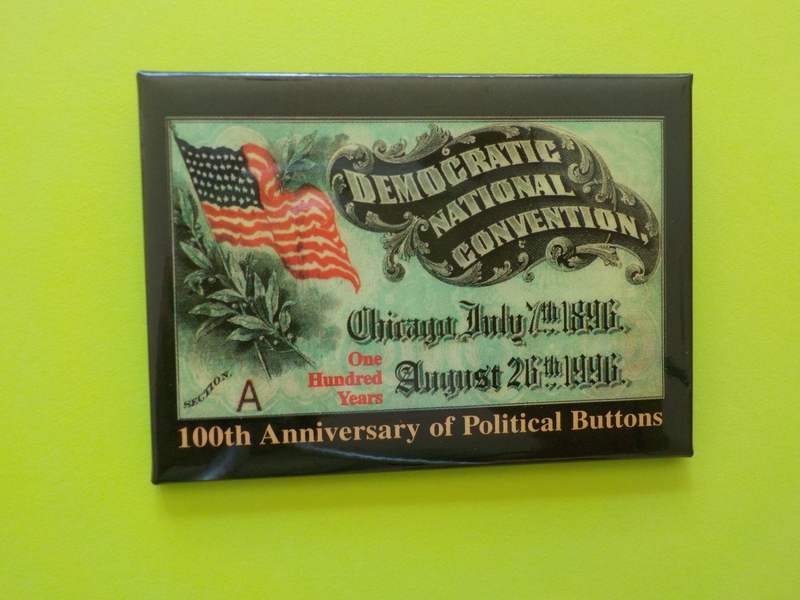 The first century of political buttons.